Van Werven Plastics Recyling specialises in creating high-quality raw materials from post-consumer hard plastics, collected from construction waste, industrial waste and municipal recycling centres. Van Werven has a separate stand-alone machine for each type of plastic, as every material has its own properties. Having developed techniques such as these gives the company the edge over its competitors. "The company employs 300 people who passionately process around 120,000 tons of mixed plastic per year, making it Europe's largest recyling plant"
The company employs 300 people who passionately process around 120,000 tons per year, making it Europe’s largest recycling plant for mixed plastics. Its success can be attributed to its long-term partnerships with major parties for both the input of plastics and the output of high-quality raaw materials. This guarantees the flow of materials and the exchange of knowhow leading to improved business practices. The acclaimed recycling company has received awards from provincial to international levels for its ground-breaking work. 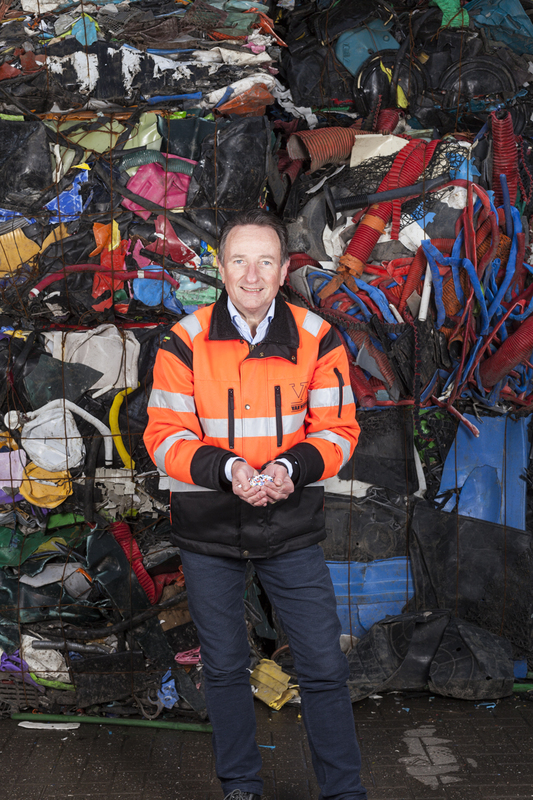 Van Werven received the Sustainable Investment Award in October 2017 for its plastic recycling activities in the UK, and it won the Dutch Circular Award 2018 in the plastics category. The company is also active in Belgium and Ireland and wants to expand to other countries. It plans to increase growth to 200,0000 tons of production in 2020.